Sea Pro/Marathon 50 hp outboards. Added cup provides superior holding and acceleration. High rake blade design for higher speeds. Uses the Flo-Torq Reflex Hub System to cushion and protect the engine drivetrain from most damage causing impacts. Flo-Torq Reflex Hub Kit For Mercury or Mariner included. 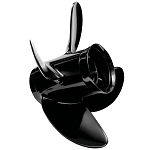 See your owner's manual for the Flo-Torq hub, thrust washers and prop nut part numbers to best fit your engine or drive with this propeller. The Spitfire provides 16-25% faster acceleration, superior holding with no penalty in top speed vs. a comparable 3 blade aluminum propeller. If engine RPM is appropriate with a 3-blade prop, replace with the same pitch Spitfire propeller.